Mirage Spa Education Canada has been providing Esthetician Courses to the Diploma level for many years. For a long time they operated a brick and mortar school as well as online classes but recently decided to close the school down and concentrate to their web based courses. As such they realized that their Joomla based website was becoming increasingly difficult for them to update on their own so they decided that it was time to redesign the web presence and make it easier for the client and her staff to manage. First thing Black Chip Marketing did was to review the requirements of the Mirage Spa business as it pertained to their online business. Over the course of several meetings we learned that the Mirage Spa registration form would require redevelopment and that they would also need to upgrade the student administration section to make it more secure and efficient. We completely rebuilt the form and made it in to a 4 page form rather than the really long 1 page form it was. We also built a secure student administration section that also made it easier to manage their student information. Prior to the redevelopment of the forms and administration section we had to convert their existing Joomla based, GoDaddy hosted website to a new hosting account and migrate all of the content to a WordPress content management system. Once we completed the migration process it was time select a theme that met the client’s business requirements and then customize that theme for their business model. A good deal of time was dedicated to exploring redesigning the logo and in the end all the logo needed was a new font and an identifying symbol to complete the branding. One of the great things about working with WordPress based sites is the amount of Plugins that are available to help customize the site. We installed a few really great plugins like Jetpack and WordFence and set them up so now they can check their stats on the fly and have a bit of peace of mind knowing that their business is more secure. 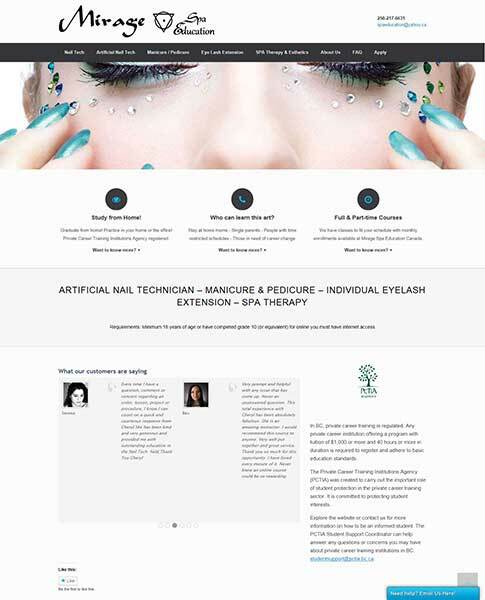 Given that the owner of Mirage Spa had a little experience with WordPress already, converting her website from Joomla to WordPress has made it so much easier for her to run her online Nail Technician school site. The new plugins that were installed and set up make it easier to maintain and secure her website. The site is now more navigationally efficient and more aesthetically pleasing to the eye. Future changes such as applying search engine optimization or the addition of images will be simple for her and her employees to do with very little training involved. While the site isn’t completely finished as of yet it is in a state that allows the client to concentrate on some other aspects of her business. When the client is ready to finish the site BlackChip.net will be there to assist to completion.